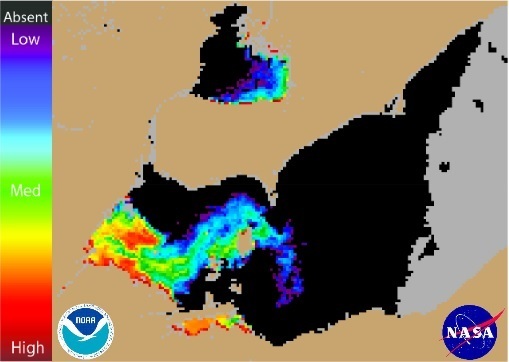 NOAA satellite image of harmful algal bloom in Lake Erie as of August 3. Grey indicates clouds or missing data, while cooler colors indicate low concentrations and warmer colors indicate high concentrations. Click image to enlarge. More than 400,000 residents in the Toledo area were given the go ahead this morning to resume drinking the city’s water after the presence of algal toxins prompted a “Do Not Drink” advisory over the weekend. Levels of the toxin are declining in water drawn from Lake Erie, and are below the safety threshold in treated drinking water, according to tests conducted by the Environmental Protection Agency and area water plants. “Laboratory analyses of samples collected at the Collins Park Water Treatment Plant and throughout the distribution system indicate that contaminants have been consistently below the drinking water advisory threshold,” Ohio EPA Director Craig Butler wrote in a letter to Toledo’s mayor. The Ohio EPA’s test results are expected to be released to the public this evening following a city council meeting. Test results from area water treatment plants, however, indicate that levels of the toxin, Microcystin, are no longer detectable in treated water. Results from tests of raw water—water taken from Lake Erie that has not been treated —show toxin levels at 10 parts per billion in Oregon, Wagner said. Levels are 0.66 parts per billion in Ottawa County, 8.08 parts per billion in Carroll Township, 0.41 parts per billion in Sandusky, and 1.26 parts per billion in Monroe, Mich. Levels in the finished, or treated, drinking water of all the above communities are non-detectable, meaning they are below 0.3 parts per billion. The allowable level for safe drinking water is 1 part per billion, according to the World Health Organization. The Oregon plant is completely separate from the City of Toledo’s Collins Park Water Treatment Plant, and did not have problems with its drinking water this weekend. Wagner does not have official information regarding actions at the Collins Park plant that made the water safe, but he said it is likely plant operators increased their chemical dosage. Drawing in a smaller volume of water from the lake, which allows the water more time in contact with the treatment chemicals, may have also been a factor. The reason Toledo fell victim to the bloom, therefore, is still unknown. “We’ll probably never know to be honest with you; that’s why we test,” Wagner said. Testing for Microcystin is not mandatory for water treatment plants, but Ohio communities have recently started testing for it anyway due to the large algal blooms. Testing at the Oregon plant, which also processes samples from several surrounding water plants — not including Toledo — was conducted once a week prior to Saturday’s incident. Testing three days a week was to begin this week, but Wagner said he will likely test every day this week to make sure there are no problems. Satellite images from the National Oceanic and Atmospheric Administration show that the toxic algal bloom in Lake Erie continues to expand. Toledo residents who are concerned about residual toxins in their water can flush their home water systems following directions from the Toledo-Lucas County Health Department. However, the city said this was not necessary for residents who had used their water over the weekend.